The parents of Leah Sharibu have confirmed the voice from an audio message, as that of their daughter, as she said that, “I can confirm to you that the voice that spoke is that of my daughter Leah. It is her voice no doubt” she added. 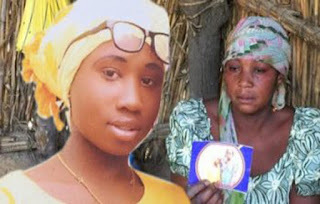 Recall that earlier today, Leah who is the only girl still in the custody of Boko Haram, amongst other school girls abducted at Government Girls’ Science and Technical College Dapchi, in an audio message made an appeal to the government to help her regain her freedom from Boko Haram captivity. She was quoted saying, “I am Leah Sharibu, the girl that was abducted in GGSS Dapchi. I am calling on the government and people of goodwill to intervene to get me out of my current situation. “I also plead to the members of the public to help my mother, my father, my younger brother and relatives. Kindly help me out of my predicament. I am begging you to treat me with compassion, I am calling on the government, particularly, the president to pity me and get me out of this serious situation. Thank you,” she said. The Nation spoke with both Mr. Nathan Sharibu and his wife, Rebecca. “I can confirm to you that the voice that spoke is that of my daughter Leah. It is her voice no doubt. I am happy that I can hear my daughter speak. This has giving me hope that she is alive. I am also happy to see her recent picture displayed. “My request is the same with my daughter. The government should play their part now by intensifying efforts to secure her freedom,” Nathan said.